I'm really enjoying seeing everyone take on Fall Decorating. 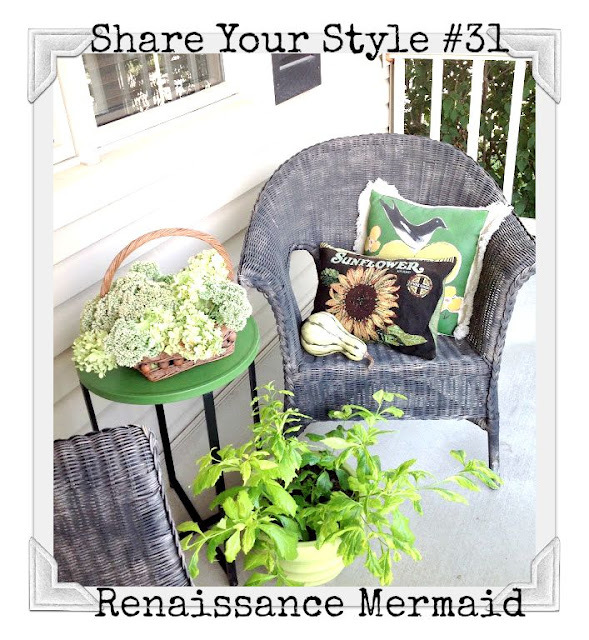 Julie from Renaissance Mermaid has created a fun and cozy display on her Front Porch using green, black, and neutrals. I love her pillows and wicker, dressed for Fall. Hope you'll run by to visit once you've linked up your posts! Last week I changed up the Coffee Table for Fall and shared a few images from my own Fall Decorating in A Taste of Fall. I hope you'll come back tomorrow as I'm one of the 28 included in the Bloggers Fall Tour, that started Tuesday. I'll be sharing my Fall Home Tour at Brenda's Blog Tour. Thanks to all for hosting a great party....happy fall! Thank you Debra for Share Your Style 31. have a great week. Hi Debra, looking forward to seeing your fall tour! I love Julie's porch as well. Thanks for hosting. Thanks for hosting, Debra. That kitchen in adorable. I'm looking forward to your fall tour. Can't wait. Hi Debra, I have been traveling about enjoying the fall tours. Yours here , the tray? I love the natural arrangement in the tray, I could pick that up and set it right in my front roommate lol season long , right through Thanks Giving. You inspired me with my tray. Always look forward to your seasonal and holiday postings you never fail or come up short on beauty and inspiration. I have bee not or king on Christmas for my etsy, and just posted a new old armoire that has taken the place of a cabinet and mirror, now to find room for those pieces... It's a perfect baxk drop for what's to come this holiday here for the BurlapLuxe home. See you and your creaminess soon. 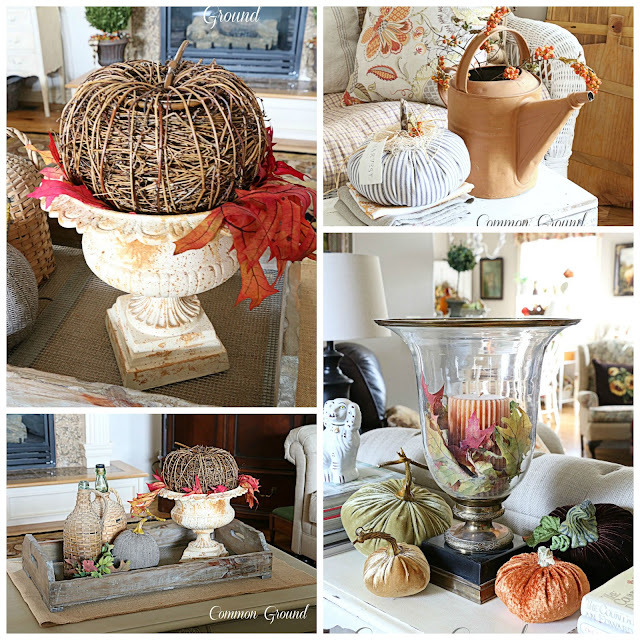 Thank you so much, Debra, for featuring my Fall decor on the front porch! Have a fantastic week! Sorry, dear one. . .I'm late to your party this week!!! Amazing featured guests, as usual!!! Here's wishing you a glorious Autumnal weekend ahead!!! Thanks for hosting the party Debra! Have a super Thursday! Debra, thanks for hosting another great party. It looks like fall is really in the air now, with all those pumpkins. Have a great rest of the week. Thanks for hosting Debra! 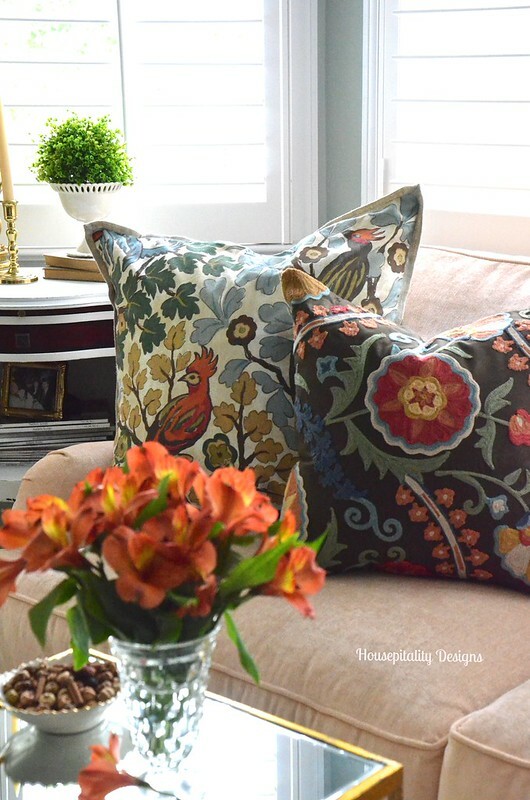 Your fall home tour was just beautiful! 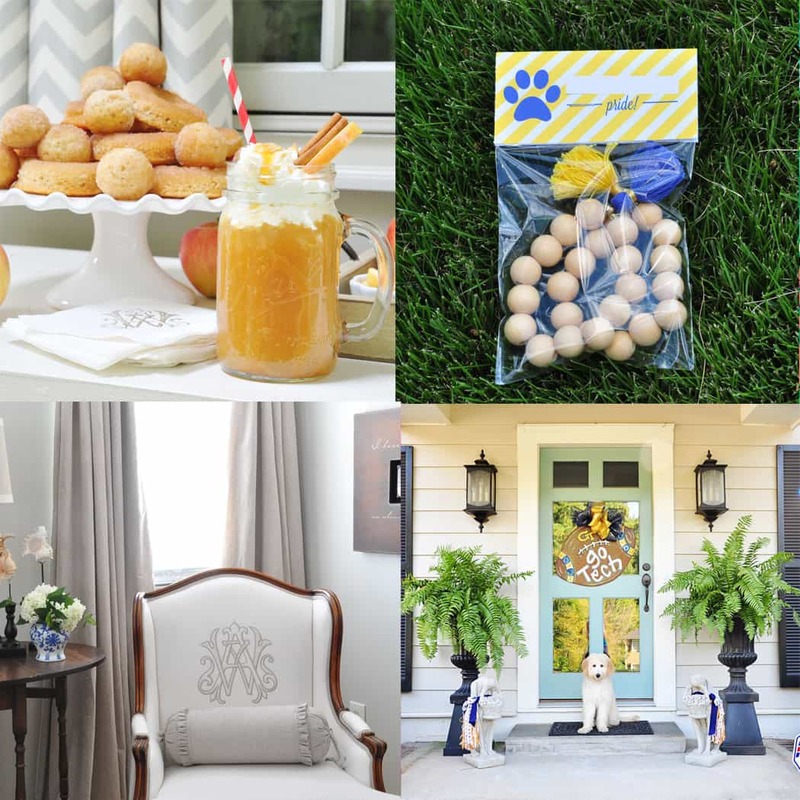 Debra, Thank you for your part in the weekly SYS that gives us all a chance who are not otherwise a part of an organized blog hop the chance to share our homes for fall open house.